German bookseller slip. Regla de la Sagrada Orden de Penitencia. 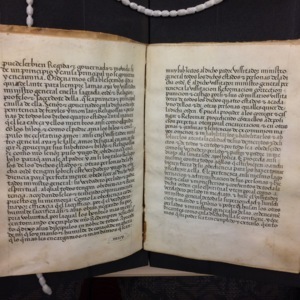 Paper insert describing the book. Binding support. Regla de la Sagrada Orden de Penitencia. 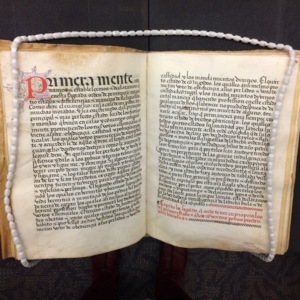 A portion of an early manuscript (12th-14th century? 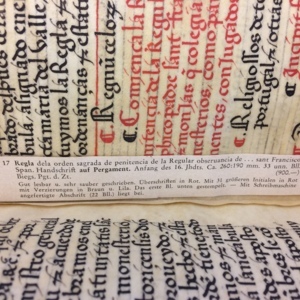 ), probably part of a breviary, used as binding support in the front cover of the codex. Wormholes. Regla de la Sagrada Orden de Penitencia. 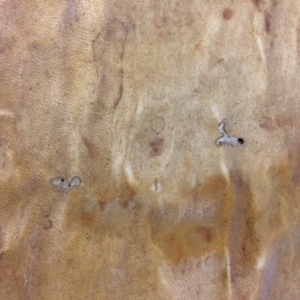 Two worm holes in the front cover of the codex. End text. Regla de la Sagrada Orden de Penitencia. 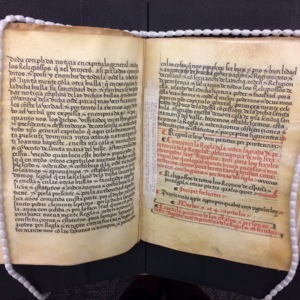 End text in red and black ink. Manuscript sewing. Regla de la Sagrada Orden de Penitencia. 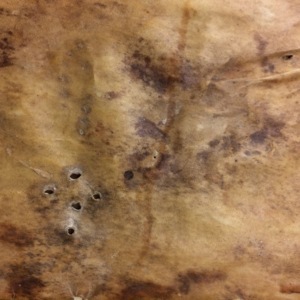 Bottom left corner of folio in which parchment has been stitched. Catchword. Regla de la Sagrada orden de Penitencia. 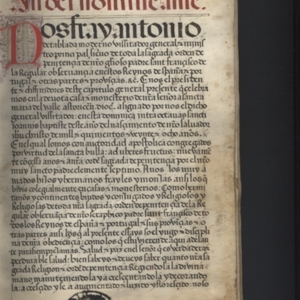 Small word in margins of lower right-hand corner of verso (page on the left) to line up with first word on following page. 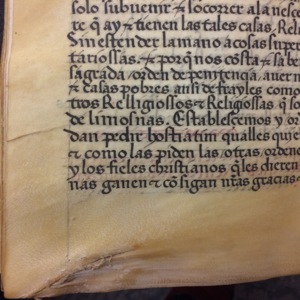 Text in black ink, legible, Iberian Gothic Rotunda bookhand. 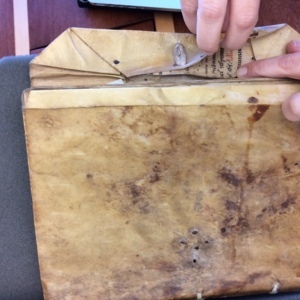 Binding holes. Regla de la Sagrada Orden de Penitencia. 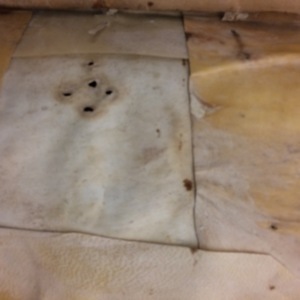 Holes in reverse of outer wallet binding where a binding clasp would once have been. Holes in inner wallet binding where a binding clasp would once have been. 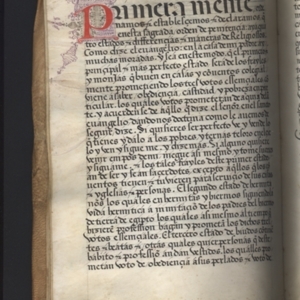 Codex cover, Regla de la Sagrada Orden de Penitencia. 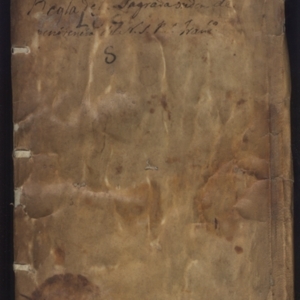 Rough, plain codex cover on parchment. Decorated capital letter A. Regla de la Sagrada Orden de Penitencia. 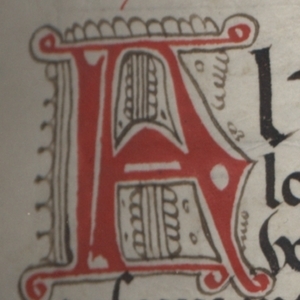 Rubricated capital letter A, with interior and exterior decoration in brown ink. Decorated capital letter O. Regla de la Sagrada orden de Penitencia. 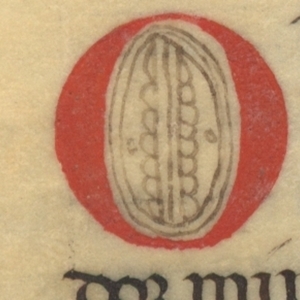 Rubricated capital letter O with rope-like interior decoration. Decorated capital letter I. Regla de la Sagrada Orden de Penitencia. 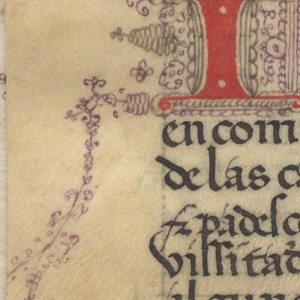 Decorated capital letter I. Decorations extend into margins, and are in brown and purple ink. Decorated capital letter C. Regla de la Sagrada Orden de Penitencia. 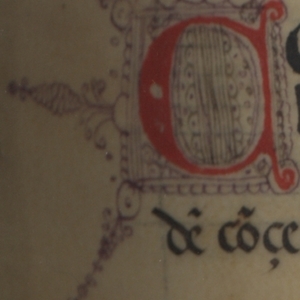 Rubricated capital letter C, decorated in brown and purple ink. Decorated capital letter P. Regla de la Sagrada Orden de Penitencia. 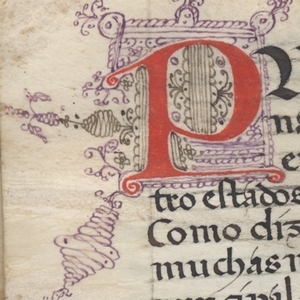 Rubricated capital P, decorated in brown and purple ink. 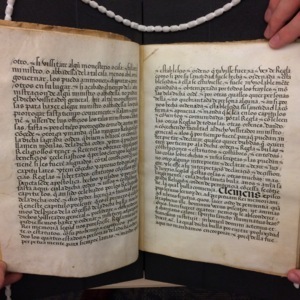 Text in black ink, including papal bull, in Latin. Regla de la Sagrada Orden de Penitencia. 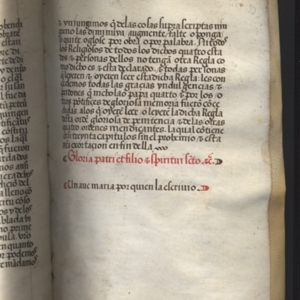 Iberian Gothic Rotunda bookhand in black ink, with enlarged word "CLEMENS" to indicate the start of the papal bull, in Latin.